Jose Mourinho was reluctant do discuss Marouane Fellaini after Manchester United lost a late lead against Everton. Fellaini was a late sub at Goodison Park. 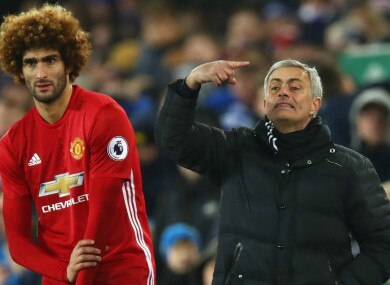 MANCHESTER UNITED BOSS Jose Mourinho did not come to the defence of Marouane Fellaini after the midfielder conceded a late penalty in the 1-1 draw against Everton. A few moments after coming on as a late substitute for his 100th United appearance, the midfielder fouled Idrissa Gueye in the penalty area, allowing Leighton Baines to score from the spot and cancel out Zlatan Ibrahimovic’s opener. The draw means United have won only two of 11 Premier League matches, with the under-pressure Mourinho reluctant to discuss the Fellaini incident after the game. When asked what he made of the penalty decision, Mourinho told BBC Sport: “No comment. No thoughts. I do not comment. Mourinho, who also refused to discuss a two-footed lunge from Marcos Rojo on Gueye in the first half, added: “No [we cannot do more to change our luck]. “We have to work the way we are doing. There have been amazing performances from Phil Jones and Rojo, players who have never [rarely] played for the club for the past two years. “To perform in five consecutive matches against difficult opposition, I am so happy with the individual performances. Email “Mourinho has 'no thoughts' on Fellaini penalty incident”. Feedback on “Mourinho has 'no thoughts' on Fellaini penalty incident”.